This Sunday in Nowlan Park patrons will be offered two very special publications to purchase. 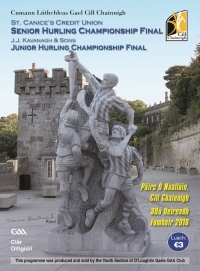 Firstly the County Final match programme, which features a photo of the Kilkenny Hurling Monument on its cover, has all the info you will need on the St Canices Credit Union Senior Final and the J J Kavanagh & Sons Junior Final. It will also have team information on the Senior Relegation clash at Palmerstown and the Kilkenny Honda Centre Minor C Final between James Stephens and Tullaroan. 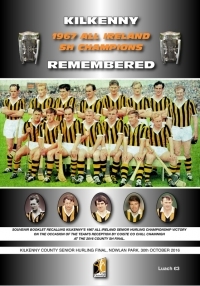 To mark the introduction of the Kilkenny 1967 Team on County Final Day a special souvenir publication will also be available containing match reports, photos and newspaper reaction to Kilkenny's win over Tipperary in that final. Both publications cost €3 and will be collectors' items.